Geological structures are three dimensional, yet are typically represented by, and - terpreted from, outcrop maps and structure contour maps, both of which are curved two-dimensional surfaces. Maps plus serial sections, called 21/2-D, provide a closer approach to three dimensionality. Computer technology now makes it possible for geological interpretations to be developed from the beginning in a f… ully three dim- sional environment. Fully 3-D geological models allow significantly better interpre- tions and interpretations that are much easier to share with other geologists and with the general public. 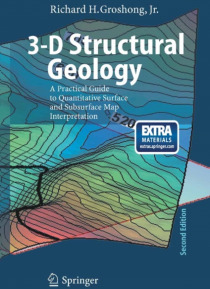 This book provides an overview of techniques for constructing structural interpretations in 2-D, 21/2-D and 3-D environments; for interpolating - tween and extrapolating beyond the control points; and for validating the final int- pretation. The underlying philosophy is that structures are three-dimensional solid bodies and that data from throughout the structure, whether in 2-D or 3-D format, should be integrated into an internally consistent 3-D interpretation. It is assumed that most users of this book will do their work on a computer. C- sequently, the book provides quantitative structural methods and techniques that are designed for use with spreadsheets, mapping software, and three-dimensional c- puter-graphics programs. The book is also intended to provide the background for understanding what interpretive software, for example, a computer contouring p- gram, does automatically. Most techniques are presented in both a traditional format appropriate for paper, pencil, and a pocket calculator, and in quantitative format for use with spreadsheets and computer-graphics or computer-aided-design programs.